Cross-Cut Shred Size 0.04 x 0.19"
Capacity / Opening: 8 Sheets per Pass / 10.25"
8 Sheets per Pass / 10.25" 12 Sheets per Pass / 10.25"
12 Sheets per Pass / 12"
The CleanTEC High-Security Small-Office Shredder from Dahle meets the National Security Agency's specifications for secure disposal of top-secret documents by military, federal, state, and local government agencies, as well as department of defense contractors. With a capacity of up to eight sheets per pass, this shredder reduces paper into consistently-fine 0.04 x 0.19" cross-cut particles in conformance with security level P-7 standards. The opening is 10.25" wide and accommodates both letter- and legal-size sheets. 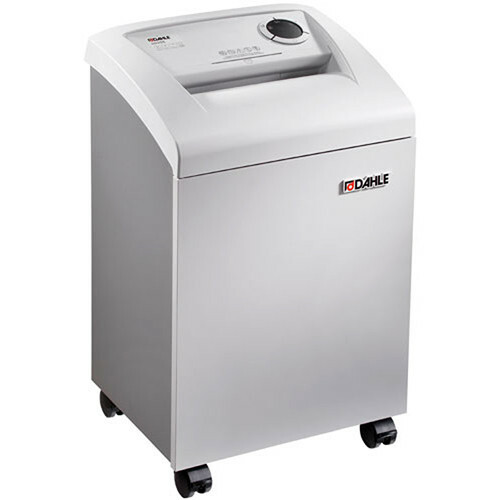 This shredder comes with an integrated air-filtration system which permanently traps up to 98% of the fine dust particles which are created around the cutting cylinders while shredding, preventing those particles from reaching your office environment. This shredder is equipped with the Safe Technology Package which provides verbal and contact shut-down options: In the event of an emergency, the shredder can be immediately halted by saying "stop" or tapping the top cover of the machine. A switch located at the back of the machine provides an additional emergency shut-down option. Electronic sensors around the feed opening add personal protection by turning the shredder off when fingers get close. CleanTEC High-Security Shredders optimize energy management by using the SmartPower system: Sleep Mode engages after ten idle minutes, and after 20 additional minutes of inactivity the shredder powers down completely. To keep your shredder running at peak performance and increase its lifespan, the integrated Dahle EvenFlow Lubricator provides continuous automatic lubrication to the shredding mechanism. Box Dimensions (LxWxH) 48.0 x 43.0 x 40.0"